When fall officially arrives and temperatures start to drop, it is difficult for most to keep up with a disciplined training and exercise schedule. At 2AM on November 1st, the clocks go back and we get extra hour in the day. If your schedule is as hectic as mine, I am pretty sure that you can think of a million things you could do with that time. Adidas Canada is challenging the Toronto community to do more with this extra 60 minutes by participating in their #RunMore10k race this Saturday night. Night racing isn’t anything I am used to but since my hip injury, I have been welcoming any opportunity to get these legs moving again. Unique in many ways, this will be the only race that ends with the runners going back in time and 100% of the proceeds will be going to the Canadian Olympic Foundation to help our athletes. A flat, out and back route along Martin Goodman Trail will easily allow new runners to pace themselves and it will give novice runners the chance to push their speed limits. Plus, with DJ’s, photo booths and beer/food tents, the finish line at Ontario Place will turn into the coolest post race party ever. My road to recovery has been much tougher and longer than I had anticipated. The last couple weeks has been all about increasing my strength with weights in the gym and getting a few low km runs in each week. With my next half marathon just around the corner, the Adidas Run More 10k is the perfect event to take some of my race day anxiety away. Having the right treatment team behind me and equipment has been integral part of the process of getting me to the start line. I have tested out roughly 10 shoes over the last month but my body has reacted best to the Adidas Ultra and Energy Boost running shoes during this time. My hip and ankles have been responding very well to the extra foam cushioning and responsive energy of the BOOST technology. With the race just days away, registration is already full, but that doesn’t mean you can’t come out to party and support those who are running. To learn more about the Adidas Canada Run More program and for all race day information head to RunMore.ca. There is a well known saying within the global running community which is, “If you’re not running…you’re cheering”. I have never missed out on a race due to injury until now and have grown accustomed to pounding the pavement amongst thousands of other runners who rely on weeks of training and cheers from the crowd to get to the finish line. As an injured runner there are several phases of recovery that you go through and denial is part of that process. Once I passed the denial phase and realized that running in this year’s Scotiabank Toronto Waterfront Marathon was no longer a reality, I decided to see what it was like on the other side. Turning my focus to community, I channeled my energy for this year’s race into fundraising and cheering. Participating in the Scotiabank Charity Challenge and raising money for the Children’s Wish Foundation opened my eyes to a whole other side of running. Plus, cheering with Parkdale Road Runners and NRC, I was part of the most epic cheer squad EVER at the 19km mark. To my surprise, witnessing 26,000 runners take on the course was much more powerful than any personal running experiences have been. Sure, running would have been rewarding, especially if I had PB’d or better yet BQ’d (Boston Qualified), but I became obsessed watching each runner pass me wondering what their story was, how they got to the start line, and who they were they running for. Were they running for themselves? Were they running to pace or support someone else’s goal? Or, to raise money or awareness for a charity? STWM is remarkable because you see participants at all levels from Elites to beginners, running or walking everything from a 5k to a full marathon. Known for being flat and fast, this course is perfect for those looking to Boston Qualify or simply PB. Most importantly, runners are encouraged to challenge themselves beyond the physical element of the race and run for a charity through the Scotiabank Charity Challenge. My personal highlight of this year’s race was partnering with the Children’s Wish Foundation as part of the #ScotiaChallenge, to help raise money and awareness for my favourite charitable organization. In case you missed my first Children’s Wish Ontario Chapter experience you can read it here. Another special element of this year’s race was Bridge the Gap (BTG). BTG is where run crews converge in a selected city each year and are hosted by that city’s members – this year’s STWM saw over 30 run clubs from around the world. The ethos of BTG is to “Train Hard. Run Harder. Play Hardest.” From Friday to Monday, the international BTG community took over “The 6” and visited the AGO, sang shameless karaoke at the Gladstone Hotel, did a special shakeout run with Parkdale Road Runners and of course the highly anticipated post race party where there was a DJ battle with a music set by each city in attendance. Being on the sidelines, I had more time meet some of the amazing runners I’ve connected with via social media over the past few years. Watching my friends pass me at Crew Love Corner gave me goosebumps. Locking eyes with each of them as they approached, and watching the energy being transferred from the cheer squad to each runner was intense. Their reactions to recognizing familiar faces all screaming, playing music and throwing copious amounts of confetti was priceless. It is something you have to experience yourself to understand. It was only then when the FOMO of not running the race disappeared. My spirit animal Leigh Gerson of Black Roses NYC, who has been my social media pen pal for almost a year, cruised to the finish line of the half in 1:24:28 minutes, coming in 3rd place in her age group (that’s with no training ladies and gentleman). She is a beast and inspires me and other female weekend warriors every single day! Witnessing my #OnTheRunTO girls run their first half-marathon was extremely emotional. As I watched them run by me, the last three months flashed before my eyes. I recalled every rain run, injury, the 6 a.m. training sessions and the altering they made to their social lives to accommodate Saturday morning long runs. I was so overwhelmed when I saw Anna Bediones, I literally jumped into the race and ran with her for 20 feet. Each of the 25,000 runners deserved to have every single one us at “Crew Love Corner” standing in the freezing cold cheering our butts off for them. It has been almost a week since race day and if you’re following the hashtags #STWM, #ScotiaChallenge and #BTGYYZ on any social media channel, you will see that people are still posting photos keeping the vibe alive. That’s how powerful the weekend was. Due to the race’s popularity, registration for the 2016 Scotiabank Toronto Waterfront Marathon opens in just a few weeks on November 17th 2015. Need a bit of motivation or want to make your run in next year’s race more meaningful? Take part in the Scotiabank Charity Challenge and raise funds for a cause close to your heart. To learn more about this epic race weekend and to find out how to register for 2016, head to TorontoWaterfrontMarathon.com. It is October and that can only mean one thing for runners; fall race season. There are several important races that happen this time of the year; such as the San Francisco Nike Women’s Half Marathon and the Chicago Marathon, but Toronto has its very own prestigious race this month that attracts legions of international runners every year. The Scotiabank Toronto Waterfront Marathon has become a fan favourite because its “flat and fast” course, that leads to many PB’s and is also known as a traffic-free Boston Qualifier. I had big plans for race season this year until they were interrupted with a chronic injury, but I still wanted to find a way to take part and also do some good for my community. Personally, what I love most about the Scotiabank Toronto Waterfront Marathon is the race’s charity component. The Scotiabank Charity Challenge allows runners to go the distance and raise funds/awareness for their favourite charity. I feel blessed to have the opportunity to be able to use my voice and running to raise awareness for causes and my #ScotiaChallenge this year was to give back to the Children’s Wish Foundation. Through my own personal health issues, I learned that happy and positive experiences when you’re sick can be just as effective as medicine (some argue even more so). Children’s Wish Foundation is dedicated to providing kids with life threatening illnesses the opportunity to have their biggest wishes come true. Since granting their first wish 30 years ago, the Foundation has gone on to grant over 22,000 wishes – with the largest amount granted by the Ontario Region Chapter. I got to spend some time with the team at their office last week and had the pleasure of attending the organization’s largest private event at Mosport Racetrack during Thanksgiving weekend. In its 25th year, the Children’s Wish Foundation’s “Ride-Along”, in conjunction with Pfaff Automotive Partners, is an amazing event for children with life-threatening illnesses and their families where they get to experience the thrill of driving the infamous racetrack in some of the most expensive vehicles with local race car drivers. During the event I got a chance to meet a very special 7-year-old at the side of the track who was eagerly waiting for her second spin with her twin sister. Taylor Roberts was diagnosed with Leukemia almost two years ago to date and spent nearly half of this time in insolation in hospital, separated from her family, including her twin Alicia. I will be honest, I was drawn to this family right away when I found out the parents had twin girls who had two very different lives due to Taylor’s diagnosis. In fact, I had assumed that having one twin who was healthy, might have made it more difficult for the other that was facing a life threatening illness. Much to my surprise, the twin’s Mom, Wendy Roberts, explained that it was in fact the complete opposite. “They are best friends. Alicia has not only been Taylor’s rock during these last couple of years but has also been her life line to the outside world – reporting back to Taylor on what’s going on at school, etc., allowing her to feel more included than left out.” Within the last 24 months, Wendy was forced to quit her job as a Communications Specialist in the financial sector and her husband has taken a leave of absence from his job, made possible by his understanding employer. To call their situation stressful is by far an understatement, however; the family looks forward to day outings like these where they can enjoy the time together as a family. Click here for more information on the Scotiabank Toronto Waterfront Marathon and the Charity Challenge. Wishing all the runners and walkers the best of luck on October 18. Can’t wait to see some of you cross that finish line and raise money for causes close to your hearts. As a street athlete and runner, I’m always looking for ways to challenge myself. That’s part of the beauty of running. No matter what level you’re at, you can always find ways to push yourself without being an Olympian or competing at an international level. Whether pursuing races of longer distances or working on increasing your overall pace per kilometre, the sport always presents a way for you to improve .This summer one of my goals has been to get off road and join the trail running movement. Inspired by the influx of amazing photos I’ve seen on social media as of late, I jumped into my very first trail run about a month ago and got injured. Like most, I naturally underestimated how different it is from road running. However, after having more than a handful of trail runs under my belt, I have started to understand it’s appeal and added benefits. First and foremost, the varying terrain combined with numerous obstacles create more muscle engagement than running on the street and specifically stabilizes muscles in the foot and the ankle. Whereas, road running’s one directional movement leaves stabilized muscles underworked. Trail surfaces are also typically softer than concrete or pavement, therefore there is far less impact to your legs allowing you to avoid injury due to overuse and impact. And one of my favourite benefits, it’s pretty much hill training in disguise. No matter what trail you run, there is a good chance that there will be some inclines. They may not be long, like a paved road might be, but they will typically vary in steepness, which will constantly challenge your legs and lungs. The burning question for most runners when they decide to try out trail running is whether or not the focus should be on perceived effort and overall course time, rather than pace time when doing a training run or race. According to Tim Lytle, from MEC (Mountain Equipment Co-Op in Toronto, overall course time and perceived effort should most definitely be the focus over pace time when hitting the trails, as they typically have more technical elements and ups and downs. I had a chance to chat with Lytle for a few moments and pick his brain on running essentials and safety tips for those new to trail running such as myself. According to Tim, “Footwear is the most important thing. I’d encourage a new trail runner to try on a variety of shoes and get to know what brands and models work for them. They also need to ask themselves where they will be wearing their shoes. The tread on the soles of trail running shoes can be very different from shoe to shoe. Some have an aggressive tread that would make running on pavement awkward, while others can be used on both road and trail. In the city you’re generally running on mixed surfaces so an aggressive tread won’t work. As for clothing, go as simple as possible. I may carry a few gel packs so I like shorts with a zip-up pocket. If you want to get into longer runs like our MEC Ambassador, ultra marathoner and trail runner Luis Villgrain, you’d probably want a running vest or hydration water pack. In the summer, I like to wear a top that’s light and breathable like the MEC T1 Short‑Sleeved Crew and during colder seasons I’ll throw on a shell. The fabric on the MEC T1 breathes and is amazing at wicking away moisture from the body, a perfect combo. Tim also shared three useful tips for new trail runners to incorporate for safety and injury prevention; 1) Ensure you have the right footwear for the terrain you’re running and don’t hesitate to walk sections of the trail that are more technical 2) Pay attention to weather and be prepared because even yesterday’s weather can impact the trail today, so pay attention and 3) f you’re worried about running alone in more remote locations, ask a friend to join you. Otherwise pick times of the day when the trail is busy in case you run into any challenges. Whether it’s your first trail run or you’re a trail running veteran, your experience is all the more better with dialled-in equipment. On my runs I like to wear clothes that look great but are also functional. Apparel with light, breathable fabric that also wicks away sweat from the skin, is key to staying dry on long runs. I love MEC’s Vitality Sleeves Tank and Agility 2 Shorts. The top is ultra light with flat seams for maximum comfortability with the ability to add a layer if you need and the shorts has storage – a back zippered pocket, plus two small drop-in pockets at the waist. Morning runs wouldn’t be complete without a supportive bra and long sleeve base layer that you can throw on to keep you warm. MEC’s Mission Possible Long Sleeve is brilliant. It has clever thumb holes to ensure your sleeves don’t ride up, reflective piping on the front and back for visibility and pockets located on the left bicep to hold keys and other personal items. Last but not least and probably the most important is trail shoes. The Nike Zoom Wildhorse GTX Trail Runners have a seam sealed GORE-TEX upper to keep water out but has a synthetic mesh that still allows your feet to breathe, reflective elements making them visible in low light, and specially designed rugged outer soles with Nike’s signature waffle tread for traction on varying surfaces. Thanks to the amazing team at MEC, I am giving away this entire look to one lucky follower. Entering is simple. You must be following both me and MEC on Twitter and tweet the following, “@SashaExeter I want to take my trail running to the next level with @MEC! #SoSashaxMEC” for a chance to win. For an extra entry, you can leave a comment on this running lay down on my Instagram sharing your favourite trail to run. Contest begins Monday June 29th and ends Wednesday July 1st at midnight EST. The winner will be announced on Thursday at noon via Twitter. *Contest is open to Canadian residents only. Good luck! On June 27th and 28th, MEC Outdoor Nation takes over Toronto. turning Evergreen Bricks into the coolest overnight adult campout where camp goers get to take in live music, outdoor activities, trail runs and campfires. The weekend’s festivities will all be about celebrating a shared love for being outside, while dreaming up projects that can help other young people experience the outdoors in brand new ways. MEC, Canada’s fave outdoor collaborator is making this all happen with Outdoor Nation, which is fully funded through their commitment 1% for the planet. What can you expect? Paddle boarding, live music, yoga, hands on workshops, and awesome speakers, its a weekend outdoor lovers won’t want to miss. For more information on MEC’s Outdoor Nation in Toronto click here. Stay up to date on MEC Outdoor Nation updates by following them on Twitter and Instagram. There are so many opinions these days on the topic of juicing but I will always stand behind it because of all the benefits I’ve enjoyed while doing it over the last few years. It is the perfect way to detox and reset your body while bringing your digestive system back into balance. Each quarter I do a 3-5 day juice cleanse, that is inline with the change of the seasons and throughout this period, I usually defer from physical activity with the exception of perhaps restorative yoga and deep stretching sessions. In preparation for the Nike Women’s 15k race in June, I have been doing some research on juice cleansing and fresh pressed juices for runners, to see if there is any major benefits or areas of concern for those who are training for a race. While juicing has amazing benefits and is a great way to reset your system, runners need to choose a program that can be safely executed during their training. There seems to be only a few studies that have looked at the effects of cleanses on athletes and much of this research comes from studying Muslim athletes during Ramadan…when they are expected to fast from sunrise to sundown. These findings suggest that runners can train safely during this time, but may need to reduce the length and intensity of workouts. I recently tested this out a few weeks ago with the assistance of Cedar Juice. I have happily cleansed with the brand before and has been the most enjoyable and effective program I have used to date. You can check out my previous juicing experience with them here). I was in the midst of a fibromyalgia flareup at the beginning of the month and desperately needed to remove inflammatory foods from my diet and clean my system. However, I was a bit anxious to be honest as I was not awarded the luxury of not running during the cleanse due to my training program for the 15k. I discovered a three day juice cleanse doesn’t really interrupt training (especially if you do it over a weekend and take advantage of Sunday being a rest day) because it’s so short. These cleanses encourage a higher intake of nutrients from fruits and veggies, which can boost the immune system and have an overall positive effect on both the mind and the body. If done properly, meaning intaking an adequate amount of water to help flush out the excess of toxins faster, you should actually experience a boost of energy by the end of day two. I started my three day cleanse on a Saturday consuming only hot water and lemon followed by Cedar’s “Kale Me Good” juice an hour and a half before my long run. I played it safe that morning, listened to my body and significantly reduced by long run down to 9 km. On the Sunday I rested the entire day and made sure to significantly increase my water and green tea intake. On the Monday, I had a raw salad filled with good fats like avocados and did a light 6km run in the evening. I really felt that I needed that one meal that day to give me the energy for my team run. If you’re interested in trying out a juice cleanse this season and still would like to run or train, I highly suggest you first consult with a physician or nutritionist plus consider adding one raw meal a day to your plan. Especially on the days you plan to exercise. You do not need to to avoid hitting the pavement, but you do need to listen to your body and perhaps run fewer km’s during this time. If you’re in the midst of training for a specific race and are within a month of race day, I would not recommend a “juice only” cleanse as it tends to slow down your times, you can try incorporating 1-2 raw meals a day to supplement the juicing program. However adding fresh pressed juices to your regular diet while training for a race can also be extremely beneficial. Many runners swear by “beet doping” in other words consuming beet based juices before race day or long runs. A series of small but mostly well designed studies have associated beet juice consumption with improved exercise performance because it allows your muscles to perform the same amount of work while using less oxygen – somehow making your body’s energy production more efficient. Cedar Juice’s “Skip To The Beet” concoction also contains carrot, apple, lemon and ginger to give this juice a bit of a kick. When I am not juice cleansing, I still love this blend before my Saturday long runs. Kale based juice is also considered to be an excellent addition for a runner. Kale is one of the most detoxifying foods on the planet. It also helps fight inflammation due to it’s high content of omega-3 fatty acids, which can be a huge benefit while training and for those who suffer from chronic pain issues like myself, rheumatoid arthritis or other autoimmune disorders. More importantly, constant pounding while running apparently affects your body’s red blood cells, according to Nutritionist Joy McCarthy of Joyous Health. Kale based juice is high in iron. Without iron, your body cannot produce red blood cells and these are responsible for transporting food you eat but also the oxygen you breathe. The last to round off my juice for runners trifecta is the brand’s refreshing “Pineapple Head” juice which contains pineapples, pear and mint. Pineapples, both in food and juice form, contain enzymes that help digest protein and also offer anti-inflammatory benefits. Rich in Bromelain (the natural digestive enzyme & natural anti-inflammatory agent), vitamin C, B vitamins and potassium, making it a perfect compliment to your existing training diet. For more information on Cedar Juice’s cleanses and delivery options, head to CedarJuice.com. Interested in trying out a Cedar Juice cleanse or implementing some of the juices into your existing diet during your training? I have teamed up with Canada’s “Best Cold Pressed Juice” company to offer my readers a 15% discount at the time of purchase by using the code “SoSashaSpring”. Make sure to follow Cedar Juice on Twitter and Instagram to stay up to date on other special discounts, news and offers. In 2014 I had a remarkable year of both personal and professional developments and many of these changes I can credit to running. Last year I beat medical odds and smashed my Nike Women San Francisco race goal and along the way I met some amazing women. In case you missed out in December, I announced my #OnTheRunTO series (the winter series can be viewed here), which will be shared here each quarter. The goal of this project is to introduce you to some fabulous ladies to keep the cycle of inspiration going amongst our community. Here you will learn a bit about the women featured, how we got connected and the pieces from the current Nike collection we are running and training in. After a miserably cold winter where runners were challenged to run in the most extreme of conditions outdoors, we couldn’t be happier to welcome spring. In addition to the excitement of warmer weather on the horizon, the city’s running community has been buzzing since Nike’s announcement that Toronto will be on the list of cities to host a Nike Women Series race (you can learn more and register here before March 29th 2015, if you haven’t already done so). We got a bit of a head start on prepping for the outdoor run season and began testing out Nike Women’s spring running and training items, which are designed to help you push yourself in comfort and style. last month at Toronto’s Forme Fitness facility. Meet Vanessa Cesario: My initial encounter with Vanessa was actually not through running but within the fashion and blogging circles here in Toronto. Although we’ve known each other for almost two years, it wasn’t until last year that we discovered we shared a love of fitness and running. This young lady frequently surprises me, literally revealing a new talent every time I connect with her. Vanessa, a recent Humber Media Studies graduate and Freelance Creative Contributor, has also worked in the public relations field and is the stylish Creative Director of one of Canada’s leading fashion blogs, The Brunette Salad. If this isn’t enough, she has been developing her photography skills over the past year, has shot numerous social media campaigns for some national fashion brands and recently shot me for a designer fitness collaboration campaign. Her Fave Items: Choosing my favourite items when it comes to Nike is hard. My personal style is very athletic inspired, so when actual workout clothes are as stylish as this, my heart just sings. If I had to narrow down my go-to pieces from the spring collection, I’d say the Legendary Lava Tights; they are so comfy, super flattering, and the high waisted design ensures that you don’t reveal too much while performing certain moves while training or doing yoga – not to mention that insane print, in addition to the Nike Free TR 5 shoes for training. For running, I’ve been rolling in comfort in the Nike Air Max 2015 and happy to have been one of the first to trial the shoes here in Canada. They provide the right amount of support and cushioning that I need for the distance I currently run. My Epic Lux Printed Running Capris are great because the Dri-Fit fabric makes sure I stay dry during running. They also have more spandex content than most running tights which makes them more supportive and helps keep them in place. Meet Melanie Botswain-Watson: If you’re immersed in Toronto’s run community or attend any of the Nike NTC consumer classes, this is not a face you’re seeing for the first time. A Communications Officer at the Toronto Public Library by day who also moonlights as a model for Nike Canada seasonal campaigns, this lady probably burns more fuel points than anyone I know. If you’re looking for a new workout to try here in the city, Mel is the girl you need to talk to. She has tried just out about every single club, group fitness class and run group in the 6, often times doing two workouts a day! Her Fave Pieces: The Epic Lux Running Tights are perfect because they feel like second skin. They offer full leg coverage, great for temperamental spring weather, but have sheer panels behind the knees and down the legs for ventilation and added style. I also love that these tights have understated, but always important reflective detailing…plus not only one, but three pockets for necessities such as ID, phone and fuel. My Dri-Fit Knit Long Sleeve is also an essential piece because of it’s versatility. It can be layered with other pieces on cooler days or just worn on it’s own. The phrase “Run Fast Live Fearless” is cleverly hidden on the inside of the shirt’s hem and I expect this powerful reminder will help me through the difficult runs. The Woven Bliss Pants are also fun and functional. A cool alternative to tights for training, which are now a vital piece in my workout wardrobe. When I first started running I was doing it to help battle my pain related issues with fibromyalgia and rare kidney disease. However, over the last 6 months I have noticed a bit of a shift. I realized that running has impacted more than just my life. Through this sport, I have been able to connect with other people from all over the world and has given me the unique opportunity to motivate and enhance the lives of those around me – most importantly those who also face challenges due to illness. I am shocked every day at the feedback I get from people on social media, who have the same ailments as me or suffering from something completely different. Knowing that I have shown them that they too can reclaim a bit of their life back from mental or physical illnesses through consistent exercise is huge! Ironically, although they say that I am empowering and motivating them, their comments push me to keep going, especially on the days I find it difficult to get out of bed due to pain in the morning. My Fave Items: Yes, all of Nike’s products are insanely amazing and no matter how many things I receive – to be honest I always want more. My non-running workouts have increased as of late due to my partnership with Equinox, so it’s important to have training gear that not only provides support, but also comfortable enough to perform. The Pro 3″ Core Compression Training Tights is ideally what I wear. I feel most free having my legs bare when I workout. Although they are short, I never have issues with them riding up exposing areas that shouldn’t be seen. In regards to footwear for training, it’s really important to have the right shoe that can accommodate the type of workout you’re doing. The Free TR 4 Training Shoe is ideal for my cardio, boxing and strength training. They are lightweight but still provide dynamic support, plus they look great. Based on my gait analysis, the Air Zoom Structure 18 Running Shoe is suited for the way I run and will be the shoe I race in this season most likely. The new firmer foam along the heel in this updated version helps to reduce my pronation and the responsive cushioning is perfect for distance running. I am a sucker for bold tights. In my personal opinion, If you look good…you run good. 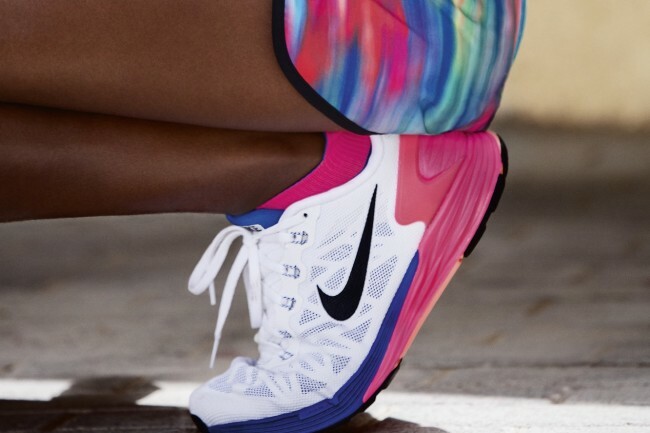 I’ve had my eye on the colourful Epic Luxe Printed Tights since the Nike Women Showcase in New York back in the Fall. The fit ensures that I am comfortable during long runs, I never have to worry about them sliding down or getting baggy in odd areas, taking away my concentration during training and storage in three separate places. The mesh panels will definitely come in handy during warm weather runs this season. For more information on the above mentioned products or to view the full collection, head to Nike.com/Women. All featured products in this post are available for purchase online (excluding Canada), Nike retail locations, in addition to Sport Chek and Sporting Life in Canada. Special thank you to the generous team at Forme Fitness, the ladies involved in this edition of #OnTheRunTO, Photographer Nathalia Allen and of course Nike Canada. For additional info on Forme Fitness’ unique training facility and their small group training classes, head to FormeFitness.com. As the running race season is quickly approaching, I have been receiving a ton of questions around how to prevent injuries during training. Last season I developed a painful IT (iliotibial) Band injury that lead to lateral runner’s knee, which almost prevented me in running the Nike Women’s Half Marathon in San Fran. The IT Band, is the band that runs on the outside of the leg from the hip to just below the knee, is one of the parts of the body most susceptible to injury in runners. If I knew then what I know now, it could have definitely been avoided. In addition to acupuncture and chiropractic care, a few key items from Gaiam really helped speed up my recovery process. If you’re new to running, foam rolling is something you need to quickly get acquainted with. Similar to traditional stretching, is a great tool for lengthening and elongating muscles but its benefits are especially helpful for runners who suffer from tight and fatigued muscles. It’s not meant to be a replacement for proper stretching, warm up or cool down, but it is a tool to limit soreness and tightness through increased blood flow and flexibility. My “Go-To” is Gaiam’s Restore 36″ Total Body Foam Roller. This high density roller is the perfect to self massage your entire body and can also be used for balance training. The bonus, it also includes a 25 minute instructional workout DVD featuring James D’Silva. You can find 5 useful foam rolling exercises in an easy to follow video here. Studies have shown that in addition to releasing stress and easing pain, Yoga can also improve your running time. The strength and flexibility you develop on the mat – namely in the core, quads, hamstrings and hip flexors can help you run more efficiently and stay injury free. Also, I have come to realize lately that Yoga can help control emotions and breathing when you’re in discomfort while pounding the pavement. Enduring an intense pose is very similar to enduring a long or tempo run. There are so many types of Yoga methods out there that will work with your specific needs. This race season I will be turning to the Jock Yoga method, created by Michael Decorte to help improve my cardio and strength and will also utilize the relaxing flows and detoxification benefits of hot yoga classes at Moksha Yoga. Decorte’s classes are quite challenging and I still have some work to do to get where I can want to be. For those moves which still prove to be too challenging in his class, I utilize Gaiam’s Cork Yoga Brick. They are a great tool for those not flexible enough to complete more advanced yoga poses and they can also be used to extend the stretch of some poses for those of you who are advanced yogis. Made of all natural materials, they provide optimal grip and traction. For my hot yoga practice, I find it imperative to have the right mat. The brand’s Sol Dry Grip Yoga Mat (available March 17th) ensures you stay slip free and secure. The innovative top coating wicks away moisture and surprisingly provides better grip the hotter you get. Constructed from a “closed-cell” material, this mat seals out germs, doors and bacteria and is also ideal for those sensitive to latex. The bonus, it’s 5mm cushioning is also soft on your joints. After class, I religiously use the Super Yoga Mat Wash, also by Gaiam, to clean my mat. With it’s organic essential oils with proven antiseptic and moisturizing properties, not to mention it’s refreshing scent, its the perfect way to clean up after class. For more information on Gaiam and it’s products head to Gaiam.ca. I am teaming up with the brand to give away these amazing products to one lucky follower. Entering is simple. You must follow Gaiam Canada and myself on Twitter to be eligible and tweet the following, “@SashaExeter I want to win the @GaiamCanada wellness prize pack #SSFitTips“. Contest begins 9am EST on Wednesday March 18th, 2015 and closes Friday March 20th at 9pm EST. The lucky winner will be announced on Monday March 23rd at 9am via Twitter. *Please note, contest is eligible to Canadian residents only! Running has introduced me to some phenomenal women who I now call friends, that I would have never crossed paths with if it wasn’t for our shared love of the sport. My connection with these women are so strong that I recently decided to create a series where I will introduce you amazing ladies each season in hopes to keep the cycle of inspiration going amongst our community. Here you will learn a bit about each of them, how we got connected and the running pieces they can’t live without during the season. This winter we chose not to hibernate and shy away from the elements here in “The 6”. We can’t choose the weather here in Toronto but we can certainly choose our winter. Never in my wildest dreams did I think I would enjoy running and training outdoors during December – but it turns out, I’m starting to like it more than running in the summer months. Over the last month, we’ve put Nike’s winter running/training collection to the test in the night, during the day, in snow, wind and rain. The brand’s winterized running items provides the warmth and breathability we need to remain comfortable, reflectivity for safety while running in the dark and water resistance to stay dry. Meet Jenna Wasserman. My first encounter with Jenna was early Spring 2014 at the Nike Queen West Run Club group. I was immediately drawn to her infectious energy and on the days I really didn’t feel like running, she was right there by my side at the beginning of the run setting my pace, while somehow still motivating the rest of the runners as a Nike Run Club Leader. In the daytime, this remarkable little firecracker, originally hailing from Montreal, works in Sales for Prospect Media Group and commutes between Toronto and La Belle Province juggling her accounts and run leader responsibilities. Meet Anna Bediones. Sure, running with Lebron James and #RunWithTheWinners Founder Steph Floss this summer was super dope but during that run I got a chance to meet Anna. It was a meeting long in the making seeing as though I had developed a girl crush on her when I discovered her Instagram account a month prior. A University of Toronto graduate who works in Marketing and Communications as a Creative Consultant, also provides freelance services as a writer and graphic designer. What she’s most known for though is her blog series for US sportswear retailer Finish Line called “Not Just For The Gym” – which is seriously brilliant. Here she styles looks that marry the sportswear aesthetic with everyday street style pieces. If you have been following me for the last 6 months you are well aware of my run journey, why I started and my amazing experience at this year’s Nike Women’s Half Marathon in San Francisco – if not you can catch up here. Unsure of what races I will be committing to in 2015, I couldn’t afford to not continue running outdoors during the winter. Running indoors until spring would put me far behind those in warmer climates who have been training outside from November until March. My Fave Items: Being a former athlete and obsessed with fashion I require that my training apparel not only functions well but looks great too. Similar to the ladies, the Flash Tights and Shield Max Jacket have been necessities this season for me, but what I have also found that HyperWarm technology and my Flash Pack running shoes have been critical for taking on the elements. The colour and pattern of my HyperWarm Engineered Print tights and training top set me apart from the other runners on the road and the ultra soft Dri-FIT fabric keeps me warm and dry by wicking sweat away from my skin. The inside of these pieces are lined with a brush fabric that is ultra cozy against the skin. Like most of Nike’s products, they are versatile and can be worn alone or can also act as a base layer under other clothing in extreme cold temperatures. There is absolutely nothing worse than a long run in the snow or rain without proper footwear. My Air Zoom Pegasus 31 Flash running shoes delivers water resistance, comfort and 360-degree reflectivity. For more information on any of the above products or to view the full collection head to Nike.com/Women. All featured items are available online and in Nike Retail locations in addition to Finish Line (U.S.), Sport Chek and Sporting Life (in Canada). Special thank you to these ladies for giving me their time and energy on this project, Nathalia Allen, thank you for sharing my vision and capturing amazing images as always, the team at Finish Line and Nike Canada. If you’ve been following me on social media over the last six weeks you are already well aware that I will be running in the Nike Women’s Half Marathon in San Francisco next month, which to be honest both excites and freaks me out at the same time. Prior to my marathon training I was running my weekly km’s in Nike Flyknit Free 3.0’s, but since July I transitioned into the brand’s latest innovation for running – The Lunar Glide 6. This year the R&D team at Nike developed the most sustainable lunar glide ever made. The updated Lunarlon foam delivers optimal cushioning and also harnesses a newly reworked Dynamic Support system for tapered support thorough a runner’s natural gait, which is perfect for my mid to long range runs. For those who are unfamiliar with Lunarlon, it can be best described as soft inner foam surrounded by a more stable outer layer, which is the key behind the shoe’s light weight and stability. Here’s the skinny: although the Flyknit Free 3.0’s were a good enough shoe for my 5-10K runs, there is no other shoe I would rather hit the streets in than the Lunar Glide 6. And I will confidently say that after recommending the shoe to more than a handful of other runners in the past few weeks, you will not be disappointed either. Nike did a superb job at making sure the shoe has a good mix of cushioning and stability, which I’m sure can be quite challenging during the design phase. The only downfall, the white mesh uppers can be difficult to keep clean and one rain run or accidentally hitting a muddy puddle could be disastrous. However, I was successful i washing my pair several times in my front load washing machine and letting them air dry overnight. After logging solid km’s in the updated lunar’s, I can confidently say this shoe can definitely handle the support/demand needs of both newbies and high mileage runners. 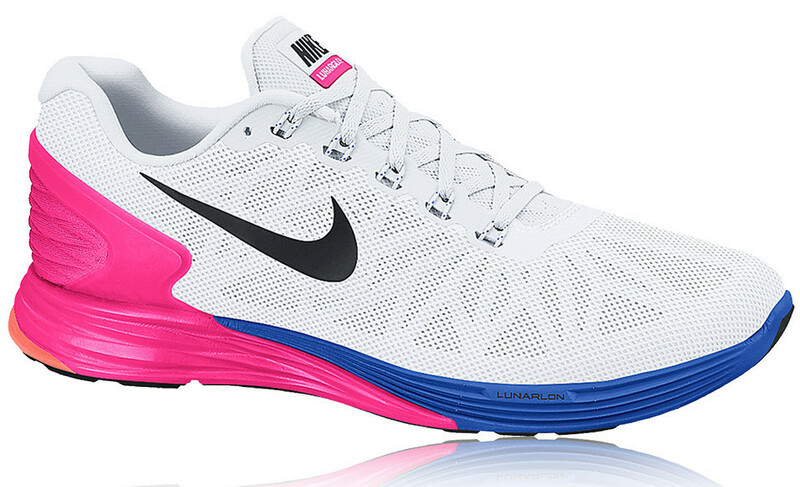 For more information on the Lunar Glide 6, head to Nike.com. They are available for purchase now online, the Nike Store located in the Toronto Eaton Centre, The Running Room locations and Sport Chek. Interested in being apart of Nike Toronto’s newly re-launched run club? It’s free, open to the public and a fun way to crush extra kilometres each week in the city. In case you missed my post on what you can expect and the training schedule, you can find full details here.